Gather together a few simple supplies, including a tissue cube, a TP roll, plus some colored paper. 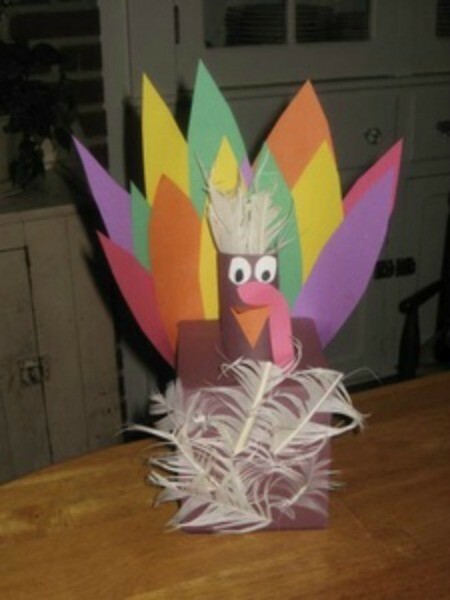 Now you are ready to make this recycled tissue box turkey craft to use in decorating for fall or as a centerpiece for your family's Thanksgiving dinner. This is a cute craft to make from materials you most likely have around the house. Tape or glue the brown construction paper around the empty tissue box as well as the toilet paper tube. Cut a hole at the top of the box where the tissues would normally come out. I just made an "X" in mine. Insert the TP tube into the tissue box and tape in place if needed. Add eyes, a beak, and a snood by cutting the parts from colored paper. Glue or tape them in place. Cut out feather shapes from the colored paper. Tape or glue the feather shapes to the back of the box. Add real or artificial feathers on the front and sides of the box. We have a turkey farm, so naturally I did not spend money on buying artificial feathers. You can buy colored feathers in the craft section of the store though. Place a few feathers at the top of the TP tube also.